Experience the sights of Philadelphia with a personal guide on this private, 2-hour sightseeing tour. Hop in a comfortable minivan (for up to six people) and ride from river to river. 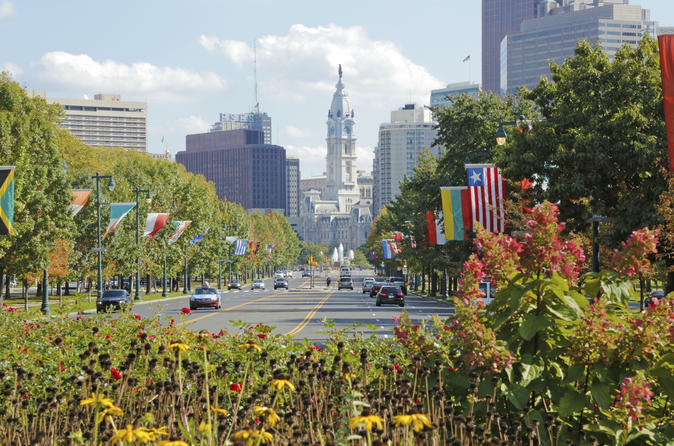 See the Historic District, Penn's Landing, the Italian Market, the Rocky Steps at the entrance of the Philadelphia Museum of Art, and much more. This private, 2-hour driving tour begins with a local hotel pickup in a comfortable minivan. Many of the must-see highlights in Philadelphia can be visited in a 2-hour time frame. Let the guide show the way, but feel free to request any specific attractions or landmark locations of interest. A tour designed for those with little time and interested in seeing some of Philadelphia's most popular locations: ride through Old City and Independence National Park, plus a photo stop at the world-famous Love Park, or a run up the Rocky Steps at the entrance of the Philadelphia Museum of Art. In order to help you see as much as possible in these short 2-hours, there is limited time to explore on foot. The tour ends with a drop-off at any Philadelphia hotel or city-center destination.